The Aboriginal population of Tasmania became separated from the mainland some 12,000 years ago when the sea level rose, flooding the Bassian Plains. Archaeological excavations of the earliest known occupation site in Tasmania, at Warreen Cave in the Maxwell River valley of the south-west, have provided evidence of Aboriginal presence at least 35,000 years ago. This discovery means that the Tasmanian Aborigines were the most southerly peoples in the world during the Pleistocene era. The complexity of changes in the social, cultural and territorial structures of the Tasmanian Aborigines over time is largely unknown. It is evident from the ethnographic and archaeological record, however, that at about 4,000 years ago the Aborigines dropped scale fish from their diet and increased their consumption of land mammals, such as kangaroos and wallabies. At about this time they also stopped using bone tools, and refined their making of stone tool implements. Canoes were crafted during the last 2,000 years and used to exploit the seal colonies of the west and south-east coasts. The archaeological evidence indicates that the Aboriginal population of Tasmania had been expanding, at least territorially, from 4,000–3,000 years ago until the British invaded their lands in 1803. The use of fire to open up forested areas may have played a major role in this expansion. At the time of British colonisation the Aborigines were formed into nine tribes, each of which had between six to fifteen ‘bands’. The population is thought to have been in the range of 4,000 to 10,000. As a predominantly nomadic people, their movements followed the seasonal changes in food supply, such as shellfish, seabirds, wallaby and a variety of vegetable foods. the bush were removed to Wybalenna, Flinders Island where they were housed in ‘gaol-like’ conditions. Children were routinely removed to the Orphan School, Hobart. In 1847 Wybalenna was abandoned and the 47 Aborigines left there were transferred to Oyster Cove Aboriginal Station, south of Hobart. The first mention of the Huon area of Tasmania, or Van Diemen’s Land, was made in 1777 when Captain Cook landed at Adventure Bay on Bruny Island. Eleven years later, Lieutenant Bligh in the Bounty visited Adventure Bay and planted some apple trees – the beginning of an industry. In 1793 Bruni D’Entrecasteaux visited the area and named Esperance and Recherche Bays (after his two ships), the D’Entrecasteaux Channel (after himself!) and Port des Cygnes (port of swans). In 1802 Commodore Baudin visited Port des Cygnes (Cygnet) and named the Fleurieu River (later Agnes Rivulet). One of his party, Peron, wrote of meeting a beautiful young aboriginal girl – Oura Oura – and her family. By 1843 there was a thriving community at Port Cygnet and the apple industry was already up and running. In 1849 seven casks of apples were sent to New Zealand and 4 cases of dried apples to Port Phillip and 4 to San Francisco, 9 cases and 3 casks went to Geelong. In 1854 Captain Butler Stoney wrote “Soon you sight the Huon Island at the mouth of the river. There is a safe passage on both sides of this island, though farther up the river are some rocks called the Oil Butts. By keeping Huon Island in line with Woody Island, you steer clear of all danger. Garden Island appears from these rocks. The shores on both sides of the Huon River are precipitous for a considerable way up, having very high land in the background, covered with large timber. About 5 miles distant, you turn into a deep bay leading to Port Cygnet and pass the first clearing or township of Lymington, situated on the shore of an inner bay, having some four or five houses and some small patches of cultivation, the principal trade being from sawyers and timber getters in the interior. Three miles from it, on the outer bay, is the larger township of Port Cygnet, where there are some 30 or 40 houses. It is evident that this place will be a thriving town in a very few years”. What Captain Stoney doesn’t mention is that 14 people were killed when a fire swept from Lymington to Cygnet that year. The first Catholic Priest appointed in the Huon was the Revd. Father John Murphy, who administered Franklin and Cygnet. The Parish of Cygnet was created in 1863 when Father James Holehan took charge. The first church of St. James was erected in 1867 and St. Marks church was erected in 1870. The ‘new’ Spanish inspired St James church was built in 1939. 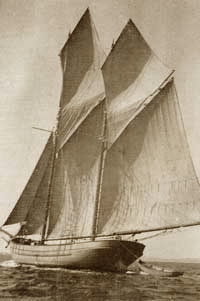 William Nichols was the first European settler in 1834 and his grandson John Wilson, the founder of a proud boatbuilding dynasty, built vessels in various parts of the bay. For some years his yard was located at Martins Point where the sailing club is now. The gradual silting up of the bay made it necessary to shift to Robleys Point on the opposite side of the bay. Some members of the family still build boats there today. The first ship John Wilson worked on was the Huon Belle in 1863, but around 90 fine vessels have left the yard over the years and are to be found in many parts of the world. A Mr. Garth operated the Perseverance sawmill. There were two jam manufacturers – Pride and the Cane Brothers. There were three hotels – Huon, Harvest Home and Port Cygnet. Gardening (orcharding?) and timber were the chief pursuits of the 1500 inhabitants. There was a Fruit Board appointed giving an indication of the growing importance of this industry. As many as 32 vessels a month passed through the area. There were jetties at Crooked Tree, Deep Bay, Coal Jetty, Herlihys Bay, Petcheys Bay, Wattle Grove, Lymington, Glaziers Bay, and Randalls Bay – these apart from Port Cygnet. All produce had to be carted by dray to these points. By 1890, steam began to take over. One of our notable first people was Fanny Cochrane-Smith. Fanny was born on Flinders Island in 1831-2. Her mother was a full-blood aborigine and her father white. She married a timber worker called William Smith in 1854 and they had six sons and five daughters. Fanny was received at Government house by Governor Weld and his wife and sang aboriginal songs which were recorded in 1903. She was a member of a 40 voice choir which sang around the district and in Hobart. Some of her descendants are still in the district. She died in 1905. Fruit growing grew in importance and in 1935 Cygnet produced 644,800 bushels of apples, 27,170 bushels of pears, 5,470 lbs of gooseberries, 31,890 lbs of blackcurrants, 100,750 lbs of raspberries, 160,880 lbs of strawberries. The apple drying and canning factories together with the jam made from the fruit from the area all helped to feed the soldiers during the wars. Fruit and timber were then the mainstay of the district. The 1st Apple Festival was held in 1952. An idea of the composite character of the festival may be seen by the sub-committees appointed – Planning, Building and Labour, Entertainment, Festival Queen, Exhibitors and Competitors, Arena Events, Apple Packing, Case Making and Wiring, Case Milling, Axemen and Sawyers, Gate Supervisors and Control, Women’s Exhibitors. Sir Ronald Cross, Governor of Tasmania in 1956, wrote “In brief, we find mirrored at the Festival the life of the orchardist: his tools and his cultivation: his foes and his weapons: his harmony with helpful nature: his fruit and his triumph”. A wet winter and early spring in 1966 led to increased vegetation growth across many parts of Tasmania. Over 1966–67, the State experienced the driest summer since 1885, and on 7 February 1967, southern Tasmania experienced the worst bushfire event in its history. While not hit as hard as some townships in the South, Cygnet lost many buildings and in the wake of the fires many families sold up and left the district. The next major upheaval resulted from Britain joining what was then known as the ‘Common Market’ in 1973. This impacted so heavily on the demand for apples that the state government introduced a “tree pull scheme” which compensated orchardists for removing their trees. The Cygnet area was severely impacted by these circumstances and many farmers subdivided their land into small lifestyle blocks and left the area. This coincided with the ‘hippy’ movement and over the next decade Cygnet attracted many new ‘alternative lifestyle’ settlers which created some tensions within what had been until then a fairly insular community. As the children of these predominantly young families grew up and attended the local schools much of this evaporated as many misconceptions were put aside and prejudices overcome. Many local families prospered from the sale of what had been land with no apparent value as many of these new settlers were more than happy to live in the bush despite the ever present threat of fire. This influx led to a great deal of creative activity and Cygnet became known as a centre of artistic activity. The first Cygnet Folk Festival was held in 1982 and it has been going from strength to strength ever since. Over the years this has become one of the most respected music festivals in the country with even the performers queuing up to attend. Traditional folk music has always been an integral element of the festival but there is something for everyone: Great Poetry Debates, Celtic Rock, Afrobeat, Stand Up, Acapella, Circus and much, much more. As well as the ticketed performances in the many indoor venues there are free outdoor activities all weekend. Cygnet’s 150th anniversary in 1984 was marked by Cygnet twinning with Entrecasteaux in France and a visit of the French Frigate “Jacques de Cartier”. Over the last 20 years or so the profile of the ‘new settler’ has changed from having being predominantly young families to a more recent influx of ’empty nesters’, sea/tree changers, bobos and retirees. Relatively wealthy older people have been moving to the district along with some who consider themselves ‘climate refugees’ from the hotter parts of Australia and overseas. This has gone hand in hand with the establishment of a food and cafe culture with good eating venues, cafes, galleries, Farmer’s Market and even our own ‘celebrity chef’! 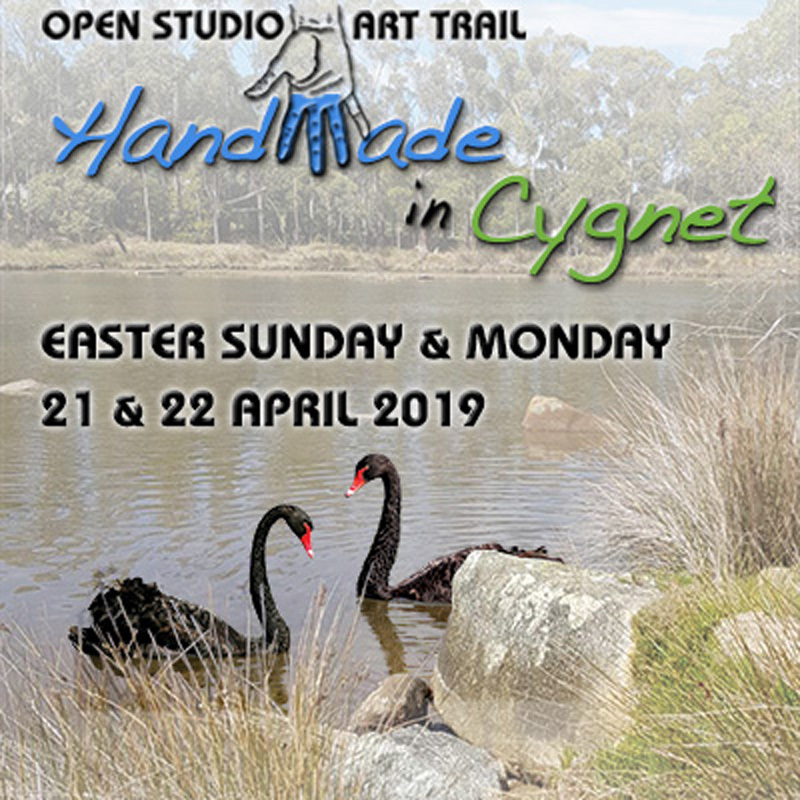 With improved roads Cygnet is less than 50 minutes from Hobart CBD and with a choice of 4 scenic routes it is a very popular weekend destination. We would like to acknowledge : The Tasmanian Yearbook 2000 and Jean Cockerill’s “Short History of Cygnet” which is to be found on Tom Wills’ site at http://tww.id.au/cygnet/history.html (Jean was Tom’s Grade 1 teacher in 1939).